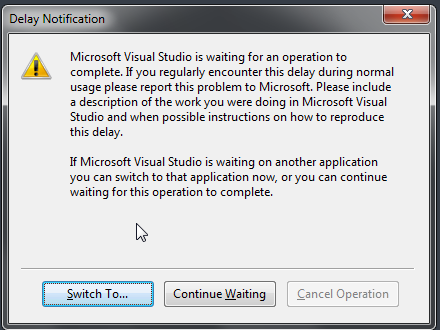 If I click the balloon "Help us improve Resharper" when I see it, I always immediately get a lockup from VS. Screen shot attached. This happens on two machines I have. "Switch to" and "Continue Waiting" do nothing, VS never recovers, and I get this dialog again as soon as I click anywhere on its UI. The only way out is to task kill. What's even stranger is that I have already manually checked the "Participate anonymously" checkbox in the ReSharper Feedback options. Don't know why it's even asking me this. stacks for all running threads? Thank you! always immediately get a lockup from VS. Screen shot attached. soon as I click anywhere on its UI. The only way out is to task kill. "Participate anonymously" checkbox in the ReSharper Feedback options. Don't know why it's even asking me this. I'll post back here if I can get it again with stack traces.